Ninjago is one of the most popular LEGO themes, and I can see the appeal — it’s ninjas with elements and hi-tech gadgets. It’s every (big and small) kid’s fantasy. 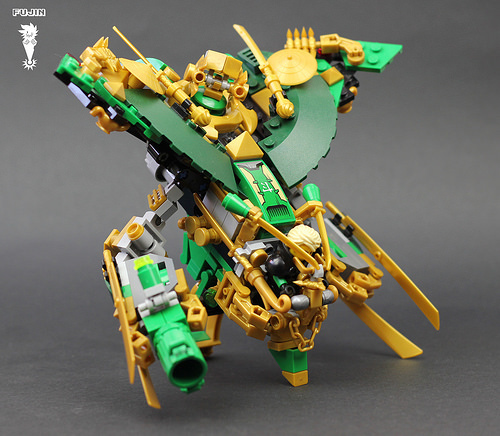 And while I’ve collected many sets from this theme over time, the most current one, Ninjas vs. Sky Pirates, is just a dream come true, and to celebrate that, I decided to build my own Ninjago-inspired mechs! First, Lloyd’s Modified flyer from the Set 70605 – Misfortune’s Keep. When I first got the set, I knew I was going to like the ship, but I was pleasantly surprised by the concept of the flyer, so I just pimped it — added new arms, a lot more greebling, more attitude, and the name “Fujin”, and called it a day. Then, you have “Kuraokami”, a mech for the ninja of ice, Zane. Built with the titanium dragon as inspiration, it has a very cold color scheme, and very sharp edges, and is built for long range combat. It fits Zane inside and does shoot from the shoulder cannon. Next we have “Kagutsuchi”. Built for Kai, it is a fire-based mech built for close quarter combat, a high mobility mech but with strong defenses inspired by Djins and Onis, wielding a fire spear that is just so conveniently useful to destroy things. It fits Kai as a pilot and as you can see is the opposite of “Kuraokami”. I have plans to build a mech for Cole (my favorite), Nya and a Sky Pirate, so it is possible you’ll find a part two of this post in the near future.